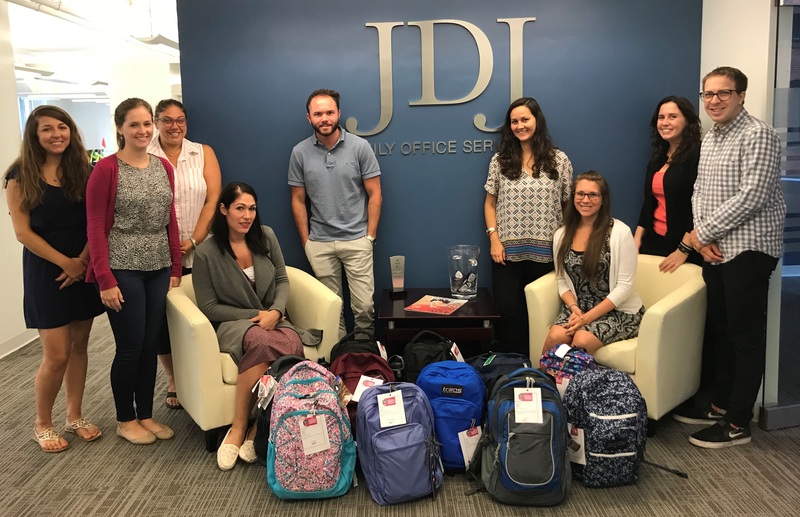 Pictured above, a few of this year’s JDJ Backpack Heroes with backpacks full of school supplies, (from left): Gina Perrotta, Elizabeth Fogarty, Elana Vasi, Rachel DeIeso, Christian Flavin, Mallory Garneau, Angela Simmons, Vicki Saris, Stafford Turnage. Additional heroes are not pictured. For the seventh consecutive year, JDJ participated in the Youth Villages Backpack Heroes back-to school drive. JDJ team members generously supported this initiative by purchasing school supplies that are most in demand and by making general donations to support this worthy program. In addition, some JDJers sponsored individual students to ensure that they receive exactly what they need for the coming school year, even choosing a backpack in their preferred color. Many of the students we sponsored this year are in high school and have a substantial list of requirements that they might not otherwise be able to afford. Youth Villages is a non-profit organization that provides help for children and young adults across the United States who face a wide range of emotional, mental and behavioral problems. They work to find solutions using proven treatment models that strengthen the child’s family and support systems and dramatically improve their long-term success. Nationally, Youth Villages helped more than 25,000 children young people and their families this year. We appreciate our team’s generosity to provide these students with what they need for a successful start to the school year.